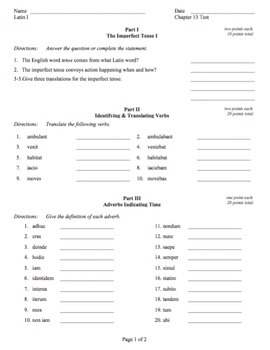 This is a Chapter 13 Test for Ecce Romani, Book I, Fourth Edition. 1) On two 8.5x11 pages so it can be printed on one sheet, back and front. 5) MS Word format, for editing at your discretion. 4) Five original sentences of Latin for translation (not from the Textbook, Workbook, or Test Masters), based on the chapter. Makes a great chapter test, chapter review, or worksheet.